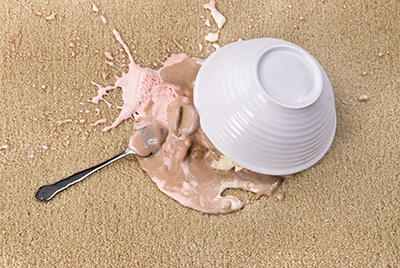 It is best to address stain removal in your carpet immediately. The longer you wait to remove the stain the harder it will be to get the spots out. We have all been faced with the task of removing stain out of carpet or area rugs. Some of us have ignored the spots in the floor for fear of not being able to remove it or simply not knowing where to begin. Vacuuming regularly helps to lessen the soil build up in the fibers. Doing this makes it easier to get the stain out. All carpet is not created equally yet many homeowners think they are the same. It is helpful to know exactly what kind is in the home so that the correct stain removing technique can be used. It will help prevent you from fading it or making worsening the stain. It is easier to blot the area where the spot is instead of rubbing it. Rubbing the stain only pushes it further and further into the carpet. It is also best to go slow when removing tough stains. There are several home remedies that can be used to help the cleaning process that are really very effective. One of the easiest ones to use is lemon juice. You can spray the stain with the lemon juice and let it set for a little while. You can then take some paper towel and dry the area. Some people like to use water and vinegar. Once the solution is poured on the stain and the flooring absorbs it, a sponge can be used to rub the stain out. The spot can then be rinsed with warm water and dried with a paper towel. If this doesn’t suffice, steam cleaning may be the proper alternative.